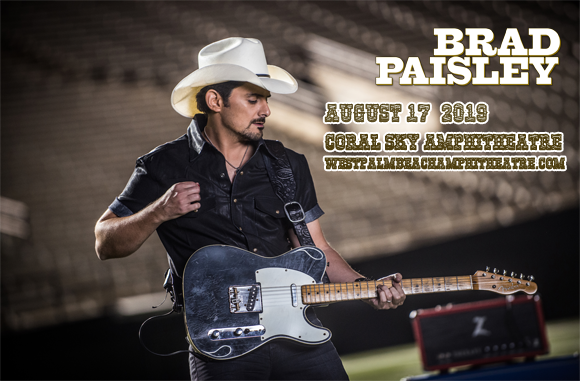 This summer, country megastar Brad Paisley is hitting the road, headed to Coral Sky Amphitheatre on Saturday 17th August 2019 with a brand new tour! Not only will fans get to enjoy a full headline set from the inimitable showman, performing classic hits and fresh, unheard material, but they'll also be treated to guest slots from country-pop artist Chris Lane and up-and-comer Riley Green! From becoming the youngest inductee into the Jamboree USA Hall of Fame to his induction as the youngest ever member of the Grand Ole Opry, it's clear that American singer, songwriter and guitarist Brad Paisley was born for a life in country music. Paisley, who was responsible for writing David Kersh's top five hit, "Another You" and co-writing David Ball's 1999 single, "Watching My Baby Not Come Back", signed his first songwriting deal in 1995 with EMI Publishing, just one week after graduating. Four years later, he signed with Arista Nashville as a solo artist, releasing his platinum-certified debut album, Who Needs Pictures, in June 1999. Paisley has released ten studio albums and one Christmas album to date, all of which have received gold status or above from the RIAA, and he has sold over 12 million records. Throughout his career, he has charted thirty two top ten singles on the Billboard Hot Country Songs chart, including eighteen number ones, and holds the record for the most consecutive number-one singles on the chart (ten). He has been honored with several awards over the years, including three Grammy Awards, fourteen Academy of Country Music Awards, fourteen Country Music Association Awards, and two American Music Awards. Paisley's most recent album is Love and War (2017).